Mentor Harbor is primarily a nature preserve with a lovely residential area. The harbor is managed jointly by the City of Mentor Ohio, the Mentor Lagoons Nature Preserve, the Mentor Harbor Yachting Club and private land owners that border the Preserve. The harbor itself is generally circular with four curving lagoons. The residential area is located on the south and west sides. The city of Mentor Ohio itself is located several miles south of the harbor/lagoons. The approaches to Mentor Harbor are clear from all directions. The outer entrance to the harbor is marked with a F GREEN light on the east side and a F RED light on the west side. Further along the entrance channel, on the east side, is a Fl WHITE light. Lining up the F GREEN, the Fl WHITE and a F WHITE located inside the harbor will give you a range line of 142oT. That range is shown on charts as is a Note to the effect that the harbor entrance is subject to change (from sandbars that can shift due to storms). Once clear of the entrance channel, there are two choices for docking. When you clear the entrance channel, Mentor Harbor Yachting Club will be directly ahead on your starboard bow. 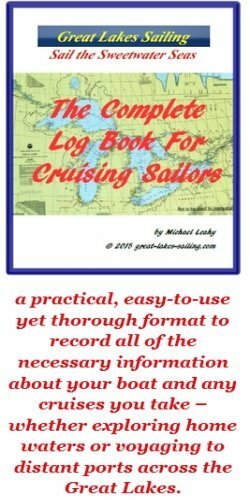 It has approximately a dozen slips for transient sailors These are available on a reciprocal basis for I-LYA club members. They have a fuel dock (diesel and gasoline) and a pumpout station. Water and power are available at slips. There are restrooms, showers and laundry facilities in the clubhouse. The clubhouse also has a large, well-regarded dining room and a very comfortable lounge. Other amenities include a swimming pool, beaches and a small ship's store. The club has a hoist and internet service is available. When you clear the entrance channel, a sharp turn to port will take you up the lagoon to Mentor Lagoons Marina. (Make sure you keep to port so that you are traveling up the outer-most lagoon.) Mentor Lagoons Marina is part of the Mentor Lagoons Nature Preserve. They have 500 slips and transient docking is available. There is no fuel dock. There is a pumpout station. Water and power are available to some but not all slips. Restrooms and showers are available. Each slip has its own adjacent green space which can be used for picnics. There are about 5 mi/8 km of hiking and biking trails and about 1.5 mi/2.4 km of beaches. The marina also has bicycles available on a first-come, first-served basis to explore the Preserve. There is a haulout facility as well. There are no repair or maintenance facilities in Mentor Harbor. The nearest grocery store is a Giant Eagle Supermarket, about 2 mi/3.6 km SW of the harbor. The nearest bank is Chase Bank, located at the south end of the lagoons. It has both teller service and ATMs. The main retail and shopping area of Mentor Ohio is located several miles south of the harbor, easily accessible by taxi. Lake County Memorial Hospital (440) 974-6800 is located about 3.5 mi/5.6 km south of the harbor. This is a major hospital facility. The nearest pharmacy is Rite Aid (440) 257-6258, about 2mi/3.6 km SW of the harbor. Mentor Harbor Yachting Club (see above) is the only dining facility within the harbor. However, there are some 150 restaurants, pubs and grills in Mentor Ohio. RubyTuesday's is a popular bar/restaurant with a good selection of seafood, steaks, chicken and pasta items. Buffalo Wild Wings is a casual grill and pub specializing in - you guessed it - wings. Lots of them, all accompanied by a good selection of sauces. In 2010, CNN named Mentor Ohio as one of the 100 best places to live in the United States. And it certainly lives up to its reputation. The Nature Preserve is clearly a focal point in the harbor, with its beaches, trails and green space. But, in addition to that, Mentor has an extensive park system - a total of some 1,200 acrea altogether. There are summer concerts and fine art festivals. Lake County also hosts the largest wine festival between the Appalachians and the Rockies every August. This Mentor Ohio / Lake County tourism and visitor's site will give you more ideas on getting the most of your visit.